Rachelle Latimer is president and chief diversity officer for TRS&I Group, Inc., consultants on meeting equal opportunity program requirements. The firm was recently hired to work with Sugar Creek Construction, one of the prime partners in the current construction of 26 miles of express lanes along I-77. 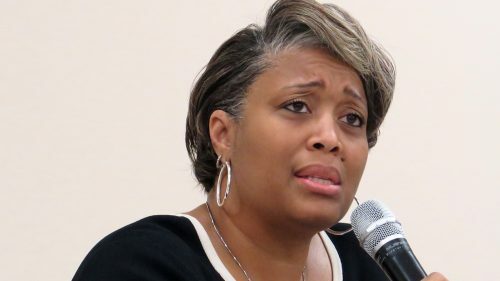 Latimer’s discussion, and her answers to questions from participants, focused on what she said was 20 years on the task of helping minority-owned firms meet the demanding standards of being a contractor on highway and other projects. Latimer’s career includes time spent on staff at the N.C. Department of Transportation. Latimer was a Business Development Specialist at the time the NC DOT was hosting outreach meetings seeking minority contractors interested in the widening of I-85 in Cabarrus County in 2013. Some of the discussion was about vital but minute details: delayed payment of invoices because required documents are missing; squabbles between majority contractors and their minority subcontractors over delayed payments; systems that mean that minority-owned trucking firms are paid a hauling fee for the dirt or stone, but don’t own the load so they can’t make a profit on reselling the dirt or stone to the state. One of the larger takeaways was Latimer’s answer when she was asked what new things could be tried to make it easier for minority contractors to get a share of the work. “For me, it’s working together. We say we work together, but we really don’t…. Instead of a lot of times having that mindset to come together, we want to try to beat somebody out. We don’t have to beat anyone out, because there is so much work. There is enough work, probably for the next 10 years at least and probably more than that. In the video below, Latimer’s presentation begins at minute 8:14. The Q&A begins at minute 11:15.